In this final Omnibus edition collecting George Per�z's acclaimed 1980s run on WONDER WOMAN, the Amazon Princess is accused of murder and struggles against the will of the gods! Plus, in WAR OF THE GODS, Wonder Woman must stop a battle that could destroy the galaxy and discover who is pulling the strings behind the scenes! 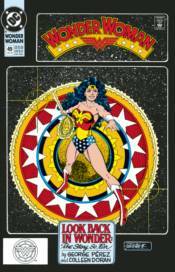 Collects WONDER WOMAN #46-62, WAR OF THE GODS #1-4, WONDER WOMAN #168-169 and #600.